Why should players have all the fun? We have a loyalty club too. Membership is free and opens up a world of privilege, reward and perks beyond your wildest imagination. All new members receive 100 Free VIP Rewards Points. Activate your membership within 15 Days and you'll receive an additional 100 Bonus VIP Rewards Points. 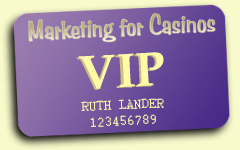 Before you know it you'll be reaping all the benefits of the #1 Rated VIP players club for casino marketers. Sessions with a Personal Coach who will help you navigate your career path in one direction… up! Thunderbird Club possibilities are limitless and designed to be acceptable within corporate gift guidelines. Join Our VIP Club Today!